ic Kathe With an E: Spring Is Here! It's spring and I am finally seeing some signs of it around the yard! I was able to go out the other evening and clean up my back garden a bit. To my utter delight I saw some tulips breakingthrough the still cold ground! Soon, I will see colors such as these below! There is nothing that brightens the day like cut tulips! My very favorite type of gardening is using bulbs. They are just so easy! In the fall I just dig a hole, drop in some bulbs, cover it back up and wait for warmer, longer days and there they are! It's almost like magic! Tulips, daffodils, hyacinth, lilies, the choices and colors are endless really! iBulb is the flowering initiative from Anthos, Holland’s Royal Trade Association for Nursery Stock and Flower Bulbs. This foundation was set up in January 2012 to focus on the financing and implementation of three activities that are important for the Dutch flower bulb sector: promotion, technical research and market access. iBulb supports 85 Dutch companies in the dry sales and forcing business, which together represent more than 90% of Holland’s flower bulb business. Learn more at www.ibulb.org. But bulbs aren't only for using the garden. Potted bulbs are the perfect solution if you forgot to plant your flower bulbs in the fall and are kicking yourself now that you see the daffodils and tulips starting to bloom. Keep them indoors and just repot in your own favorite pot to to bring Spring indoors. Using thrift store finds, you could create all kinds of wonderful Spring vignettes. Or, maybe, even give some as gifts. Once again, the possibilities are only limited by your imagination! You can even find Ibulb potted plants at grocery stores, garden centers, and flower shops. Wish my tulips were coming up but I am sure it will be awhile before they do. I should just put some bulbs in vases... I love tulips. That is definitely what I need to do, Kathe! We're still under feet of snow and sub zero temps. I'm going to get some tulips to plant indoors this weekend! How I love the cheeriness of tulips and daffodils. I'm sure mine feel betrayed by this extra long winter we're having. Have a great weekend! 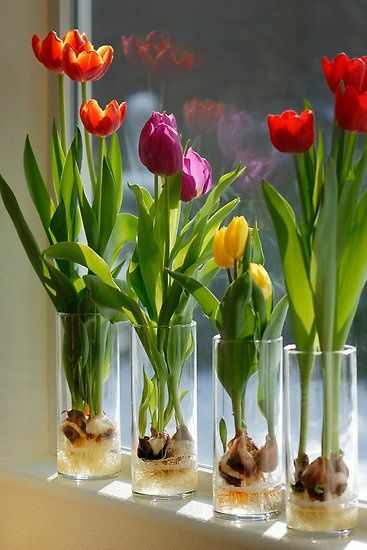 Love the bulbs in vases....what a great idea! Ι сoulԁn't refrain from commenting. Exceptionally well written! I love Daffodils, they are my favorite bulbs. I planted 300 bulbs and when we move to the new house I will be planning on planting a ton there in the fall.I love when they show themselves in the early spring it is a little reminder of warmer days ahead. Hi Kathe! I decided it was time to subscribe by email. I always appreciate your kindness and helpfulness. Those things stand out to me in a person. I have dropped by your blog a few times before, but now I will be a regular reader. Have a great day, and thanks for being you. Oh… it looks so cute… tulip is one of my favorite flowers.. Really interesting post.